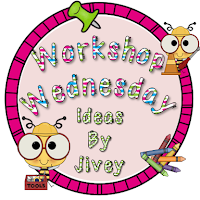 Time for Workshop Wednesday with my BBB Jivey! This week's topic: math games! This math game is quick, easy, and a fun way to open a math lesson! Students fill in the bottom row with numbers called by the teacher. They start this game by adding the two triangles next to each other and writing their answer in the triangle above. They complete each row the same way until they get to the top. First person with the correct answer on top is the winner! It's fun and it's fast! I give a ticket to every students who gets the answer correct no matter how long it takes, and I give the winner 3 tickets. If they have the incorrect answer I tell them which row has an error so they can fix their mistake. *Can be used with addition or multiplication. *Use smaller numbers for a faster, easier playing game or larger numbers to make it more challenging. This student used the side of his paper to add those last couple of rows-smart thinking! Be sure to check out all the other great ideas linked up Jivey! Congratulations to the winners of my new products! Thanks for pinning! This looks like a fun game! I am going to use it tomorrow. Thanks! Fun game! Thanks for the freebie!! Oh, yeah. I downloaded this one. Always looking for great math stations. Thanks. This likes it might be just the ticket my class needs to get motivated! LOVE IT! Going to try it tomorrow if I can figure it out for myself! I even have tickets to give out! Thanks for stopping by my blog this week and leaving such a lovely comment! I can't wait to try this with my kids. Several of them need practice adding quickly, and this seems like a very motivating way to practice. Thanks! My students love this game! In fact, I'm using it tomorrow with Combining Like Terms. Thanks for the great template!! Love this!!! I think it would be great to do with multiplication too- but I wonder if the numbers would get "too big" - I'll definitely be using it! :) Thanks for linking up, bestie!!! Joanne...I LOVE this!!! I printed it last night and tried it with my kids today. We did a practice one, but they were so into it and picked it up quickly. I cannot wait to try it again tomorrow! It is going to be the real deal though...no practice! I did tell them I was going to change it to multiplication and they all growned! I also shared it with a few other teachers! Thanks for all of your brilliant ideas! This is fantastic, will definitely use this to practice multiplication facts. A fun way to motivate and get them thinking. very amazing game specially for kids i always use this games for my all students .and they really enjoy for playing. for start grade students like these games is perfect and for all from 5th Grade to 9th Grade need to visit Math Practice Websites. because there got many solutions of every questions.